It may seem brutal, but nonetheless true, to obsrve that it is Stephen Lawrence's death rather than his life that has made his name famous. It is also true that it was the very ordinariness of his short life that underscored the tragedy of his death. To write a book dealing with his life therefore presents a special challenge to any author. Yet to prevent his name from being soon forgotten, it is necessary for young persons to be able to identify with him as a person rather than as a name associated with a series of remote Public Inquiry recommendations. Wilkins rises to the challenge by lovingly recounting the principal incidents of Stephen's life from birth to starting school, school trips, family and friends, sporting activities, secondary school, hobbies etc. culminating with his untimely death. The text is supported by attractive colour illustrations (roughly one for each of the twelve chapters) which underpin the warmth of the text. The print size and general layout should make it very user friendly for 10 to 12 year-olds. 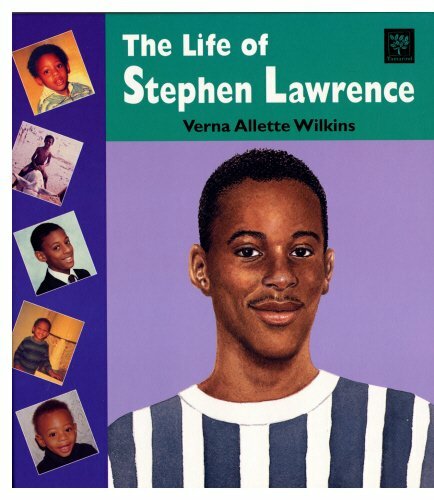 It is already eight years since Stephen Lawrence's murder and one weakness of the book is that it is based on the assumption that the reader will already know something about either Stephen Lawrence or the significance of the events following his murder. Apart from a brief postscript mentioning the setting up of the Public Inquiry following his death, there is no real attempt to put things into perspective. The only reference to the Inquiry's findings (p38) are: 'The Inquiry recommended that, "Consideration be given to amendment of the National Curriculum aimed at valuing cultural diversity and preventing racism. "'- nowhere as important in my opinion as the far reaching recommendations relating to the investigation of racist incidents, police recruitment, training, instiutional racism and dozens of other police matters which dominate the report. However useful guides are added for further information and this subject lends itself to classroom discussion or a special project involving some adult guidance.